• 4 oz "Screen Kleen" with 12 x 12 Micro Fiber cloth is the best screen cleaner. • Use for TV LCD/Plasma Screens, Camcorder/Camera Screens, Computer Screens, DVD's, CD's, Eye Glasses, and Camera Lens. It will remove fingerprints, dust, without the smear. • "Screen Kleen" is SAFE and won't abrade, harm, or remove anti-glare of the sensitive screen surfaces. • "Screen Kleen's" proprietary fluid is pH neutral (NO ALCOHOL, AMMONIA, or POLYMERS). • The Micro Fiber Cloth has ultra-fine, double-density composition that gives you more cleaning surface of any other micro fiber cloth. • NOTE ABOUT SCREEN CLEANERS: Products with high levels of isopropyl alcohol can harm polycarbonate screens and remove anti-glare coatings. Gel products can cause screen smearing. 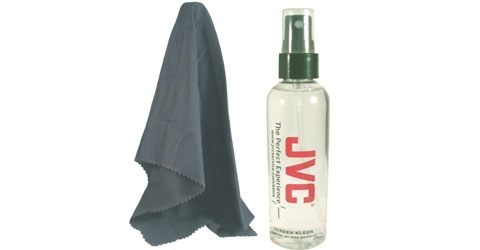 JVC's cleaner does not contain isopropyl alcohol and it is not gel based.